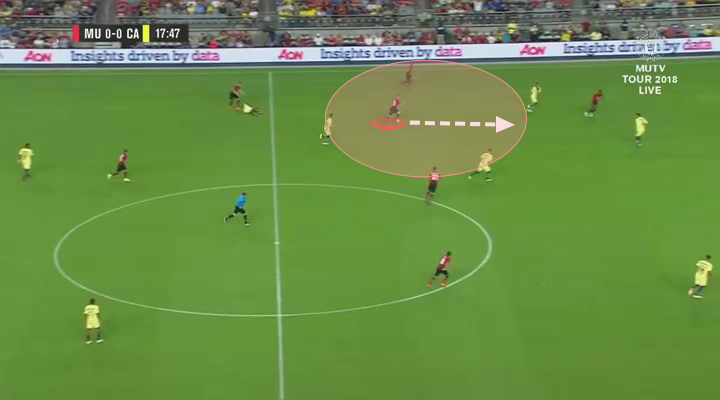 Home Match Analysis Tactical Preview How can Manchester United evolve this season? How can Manchester United evolve this season? As the Red Devils head into a third consecutive season under the management of Jose Mourinho, the pressure to deliver major silverware at Old Trafford has never been greater post Sir Alex Ferguson. Mourinho’s 6th and 2nd place Premier League finishes along with a Europa League Trophy and a League Cup triumph have overall been a welcome improvement over his predecessor Louis Van Gaal’s 4th and 5th place finishes and an FA Cup final win. There is no doubting that the senior squad United boast today is a better one than Jose inherited but there remains many discontent voices among the Old Trafford faithful regarding the team’s style of play. 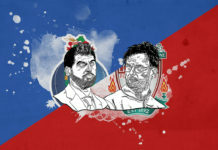 The desire among red’s supporters for a manager who can deliver both entertaining and winning football is palpable and made only stronger by the successes of crosstown rivals Manchester City. Summer additions of Brazilian midfielder Fred, Portuguese full-back Diogo Dalot and new third choice Goalkeeper Lee Grant have been welcomed by United fans, each player fulfilling an obvious need in the squad. But there are still some glaring gaps in personnel which remain worrisome, most notably at left-back. 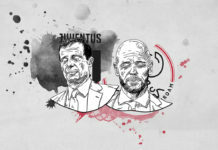 This has contributed to Mourinho’s seeming discontentment with Ed Woodward’s transfer dealings, moves for Toby Alderweireld, Alex Sandro and Ivan Perisic to name a few have all hit early roadblocks. So while the opening bets are placed the question on the red half of Manchester is how can Mourinho use the cards he’s been dealt to evolve his United side for the better this coming season? The most typical trait of a Jose Mourinho side is that they are very organised and well-drilled when out of possession, the Portuguese manager is arguably the best in the business when it comes to deploying defensive structure and seems to have a counter position for every game plan his teams come up against. The 2017/18 season saw United boast an impressive defensive record in the Premier League, conceding the second lowest tally of 28 goals behind only Manchester City with 27 conceded. Goalkeeper David De Gea won his first ever Premier League golden glove as Jose’s United kept the most clean sheets last season with 19, 1 ahead of City’s 18. The above image will not look unfamiliar to United fans. Defence first is always Mourinho’s pragmatic approach especially against rival teams, demanding his back 4 and midfield remain disciplined out of possession. His team will often pick out a danger man in the opposition side to pay particular focus to, such as Ashley Young man-marking Mo Salah in United’s 2-1 win over Liverpool in March 2018. 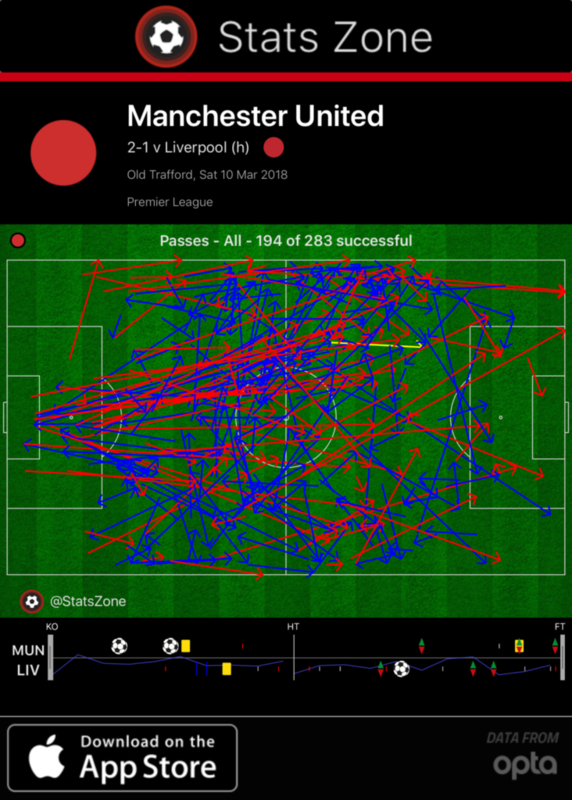 That game saw United complete only 194 of their 283 passes with very little penetration made into the attacking third. 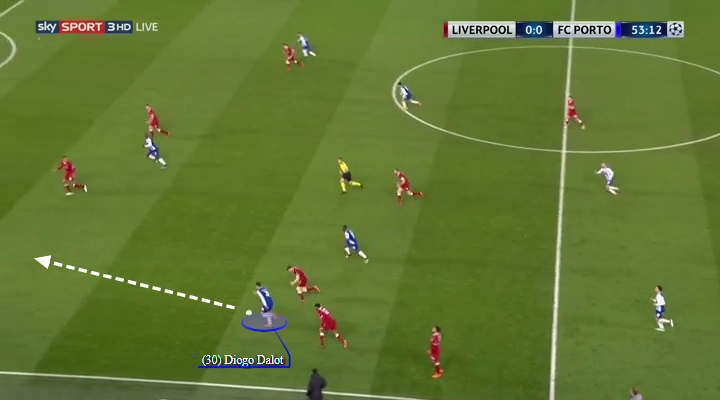 The amount of long passes from defensive areas is also visible, this is done to avoid Liverpool’s excellent high press and to hopefully catch out their high defensive line. Mourinho is always looking to counter his opponent’s setup first and foremost. But it is in possession that United’s issues are most notable as although they finished 2nd last season their tally of 68 goals was only the 5th highest in the league. 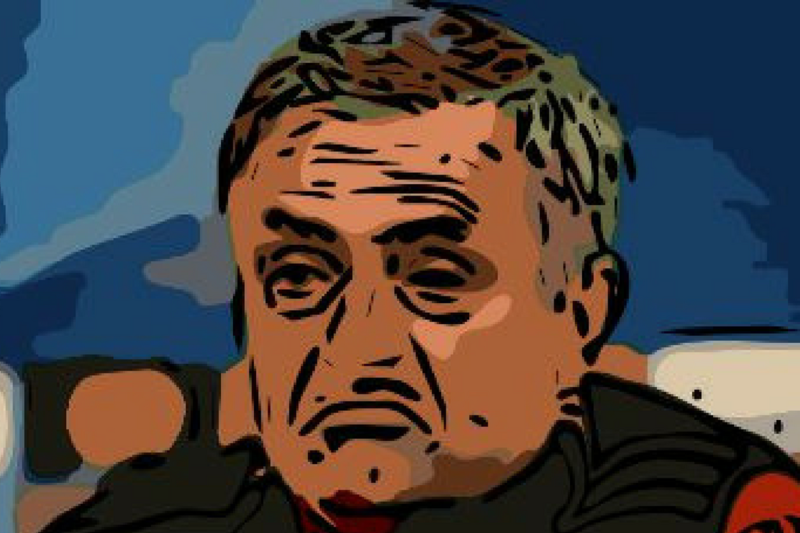 Jose’s men often struggled to break down organised defensive blocks which ironically suggests that although Mourinho is well equipped to setup such a well-drilled defence, his teams often look clueless as to how to break one down. Even in a routine home win against lowly side Swansea last March in which United made 675 successful passes there is still an obvious lack of action in the final third. 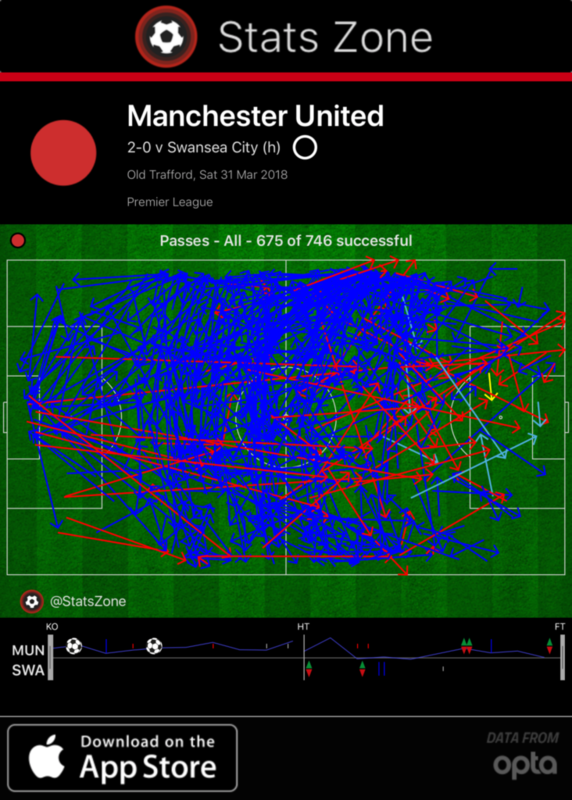 Many of the passes are sideways and backward as United tend to look ponderous in possession. Much like Pep Guardiola’s Manchester City this time last year, full-backs both left and right are problem areas for United. Antonio Valencia and Ashley Young performed admirably last season but despite both players playing most of their respective careers on the wing, they lack the attacking thrust needed by top class full-backs and therefore don’t make enough of a contribution to United’s attacking phases. Replacing ageing full-backs with young athletic talents such as City did last summer will take United’s game to the next level in both attack and defence. Kyle Walker’s pace has given Pep’s side an extra attacking thrust down their right flank as well as a greater ability to recover when possession is lost, Mourinho’s United would benefit drastically from such an upgrade. 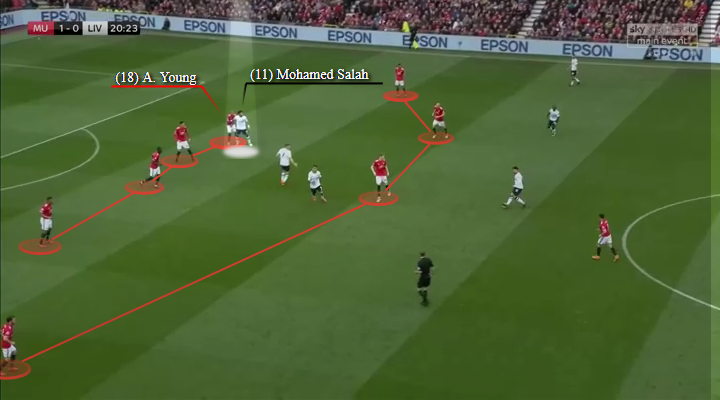 Young and Valencia each lack creativity to make regular defence-splitting passes and also lack the elite physicality to consistently exploit space in the opponent’s defence, leaving them often choosing simple options and stagnating the United attack. New signing Diogo Dalot has presumably been signed to take over from the 33 year old Valencia and although he’s only 19, Dalot’s chance to take the figurative #2 jersey might come as soon as this season. Upon signing for United the Portuguese talent was described by his new manager Jose Mourinho as “the best young full-back in Europe”. Standing at 6’0” and not lacking for pace, Dalot is already physically equipped to adapt to life in the English game. Made in the mould of a modern day full-back, Dalot provides a significant attacking outlet for his team. 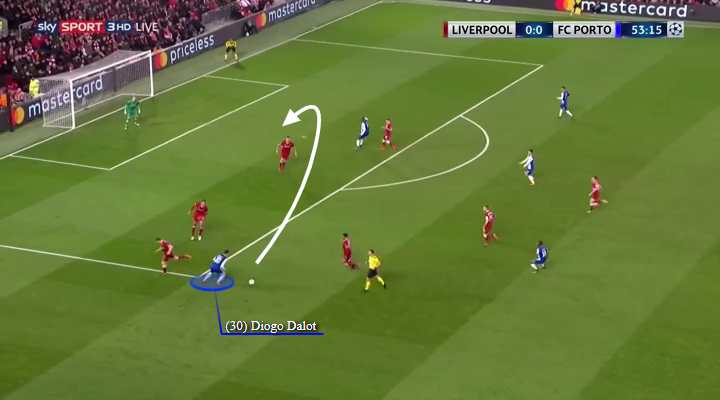 Tall and pacey, Dalot uses his physicality to take advantage of gaps in the opposition defence, eating up open grass and pushing opposition teams back. Much like Ashley Young, Dalot can play left but is right footed. Above he has used his pace to drive the opposition back but prefers to cut back onto his right foot before delivering a cross. Capable of playing both left and right-back, the young Portuguese talent could be a very astute signing for United this summer having been relatively unknown before the transfer materialised. Jose’s side often lacked quality delivery from wide areas last season, leaving their 6’2” number 9 Romelu Lukaku to look very isolated in many games when opposition teams crowded the middle of the pitch. Dalot naturally looks to get involved in attacking phases and give his team width from either full-back spot. When given the chance he will look to take on a defender 1v1. His pace and crossing ability make him a very useful attacking threat, above Dalot has sprinted past his marker to the goal-line before delivering a perfect cross for his teammate to head home. Another young full-back, although not new to the squad, is Southampton academy graduate Luke Shaw. It’s fair to say the left-back has had an unhappy life at Old Trafford since Mourinho’s arrival but with no impending inbound left-back at Old Trafford, Shaw is Ashley Young’s biggest rival for their shared position. Like Dalot, Shaw is physically equipped for the league he plays in although has had many injury troubles since his double leg fracture in September 2015, just over a year after joining the club in a world-record transfer fee for a teenager at the time. Shaw has displayed many of his qualities in pre-season, most obvious of those is his pace. Above we see Shaw allow the Club America wide man space to receive the ball but once it’s played Shaw quickly dashes to intercept the pass. The attempt is successful and Shaw immediately goes on the offensive. His first touch takes him beyond the opposition midfield and he again uses his pace to attack the empty space, driving the opposing defenders backwards. Despite his troubles, Shaw’s pace, dribbling and defensive recovery ability give him the potential to make the left-back berth his own if he can stay fit. His tendency to almost play as a second winger when his side are in possession could give United an extra dimension particularly against teams who defend deep against Jose’s men. Luke Shaw’s athleticism could make him an invaluable upgrade at left-back. 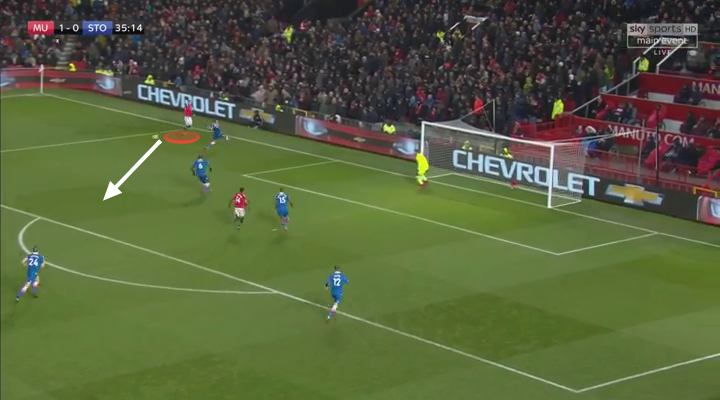 Above Pogba plays a very long diagonal pass from his own half to the opposite goal-line. 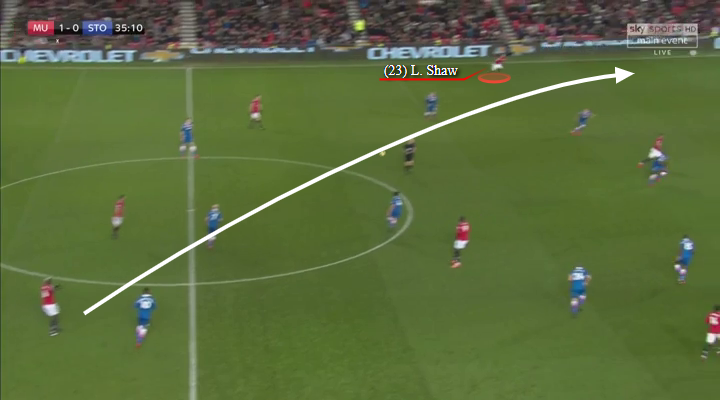 Shaw’s incredible speed allows him to retain the ball in a very dangerous area for United. Shaw comfortably gets to the ball first and plays a first time ball back into an oncoming teammate, Ashley Young simply does not have the athleticism to give United this kind of outlet. The surprise purchase of Nemanja Matic last summer gave United exactly what they needed, a commanding presence who kept structure to Jose’s midfield. The hope was also that Matic would free Paul Pogba from some defensive duties therefore giving him more freedom to play his more naturally attacking game. While Pogba did have an excellent season for United, many perhaps rightly feel he has more to offer and this view would only have been further cemented when analysing Pogba’s performances for his native France in this summer’s World Cup. Pogba was immense for his country as they won their second World Cup title which left many United fans arguing that the Frenchman is held back at United by his club manager Jose Mourinho. But perhaps Jose felt his squad still lacked the midfield personnel to give Pogba the same platform he has for his country. New signing Fred bought from Shakhtar Donetsk might be the missing cog in the machine that returns United’s midfield to the elite level, not seen since the days of Scholes and Giggs. The assumption most would make is that Jose will regularly deploy a midfield 3. Matic would resume his holding midfield position while Pogba would be the most attack minded member of the trio, leaving new man Fred to fill the gaps in between. An all-round midfielder by nature, Fred has the discipline and tenacity to aid Matic in defensive phases of play and may at times be deployed in a double pivot alongside the Serbian giant. 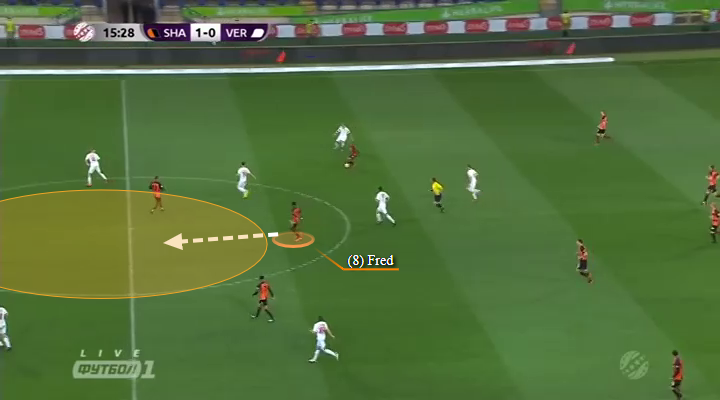 Fred is more than comfortable in a defensive role, here he screens his defence when their opponents look to counter. Fred smartly cuts off the middle of the pitch and looks to shepherd the ball carrier out wide. There he wins the 1v1 duel with his physical prowess before keeping possession and restarting the attack. However the Brazilian’s drive and passing range in possession would likely see him given more responsibility in possession than most holding midfielders and will possibly play a more attacking role against lesser sides, partnering Pogba more than Matic. In typical Brazilian style, Fred has an eye for a pass and can transition his side quickly from back to front. Above Fred looks to break into space beyond his team’s opposing midfield as soon as his teammates had won back possession. Having done so he quickly looks to play a through ball to a forward runner, instincts that should perfectly suit Jose Mourinho’s demands. Whether he’s playing off the left-wing, central as a #10 or up front with a strike partner, expect to see a lot more from January signing Alexis Sanchez in the coming season. While Romelu Lukaku remains United’s undoubted leader of the frontline, Jose Mourinho will be hoping that Sanchez will be the big Belgian striker’s perfect partner in attack. If Lukaku and Sanchez can spark up an understanding, United will have two world class forwards in tandem, in a modern ‘big-man-little-man’ strike partnership. This season will be the first in almost two decades for Jose Mourinho without his loyal right-hand man Rui Faria. Faria has more than paid his dues as an assistant coach and has decided to walk away from his position as Mourinho’s assistant, he is expected to be in the hunt for a head coach position of his own before long. Mourinho made it clear since the announcement of Faria’s departure that he would not be searching for a direct replacement for his assistant from outside the club and would instead restructure his backroom staff. United have since added the recently retired Michael Carrick to the coaching team as well as promoting their impressive young under-18s head coach Kieran McKenna to the first team. From the early signs in pre-season the two seem to be working as co-assistant coaches to Jose and United fans will be hoping their modern takes on the game can give the team a less rigid feel. But Mourinho will always have the last say and will be quick to dismiss either coach should they not buy into his methods. It would be naïve to expect an overhaul in playing style for Manchester United this season, after all this is a Jose Mourinho team we’re talking about. Mourinho has adapted the same approach to games that made him successful at his previous clubs and that trend will continue into the new season. The approach of dominating possession and controlling games with the ball against lesser sides while conceding possession and looking to control space without the ball against rival teams at the top of the league is an acceptable one for most United fans – if it breeds the right results. To achieve that Jose’s side will have to be better at both approaches, more ruthless and aggressive against lesser teams and a better unit against rival teams. A more settled and fitter Sanchez, potential world class midfield addition in Fred and an injection of youth in both full-back slots just might be enough to bridge the gap between second and first for Manchester United this season.